Bad breath, medically known as halitosis often results due to poor dental health and gets worse with unhealthy eating and lifestyle habits. Morning bad breath is very normal and occurs when the mouth gets dry and stagnates overnight. It usually clears off soon after eating the breakfast. However, persistent bad breath or a foul taste in the mouth can be the result of periodontal diseases. It is often caused due to the buildup of plaque. It causes toxins to form in the mouth, irritating the gums. If left untreated, it can damage the jawbones and gums. 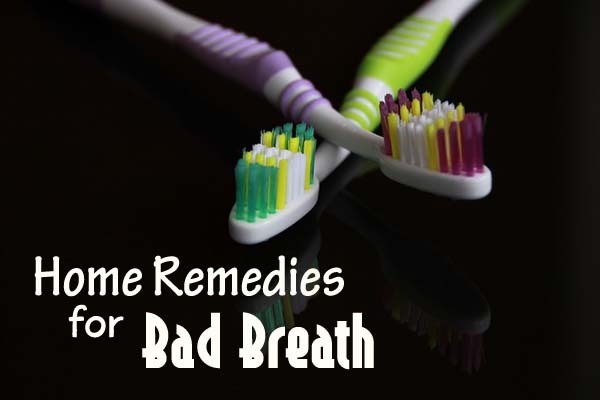 Read on further to know the causes and remedies for bad breath. Antidepressants, aspirin, chemotherapy drugs and diuretics can dry the saliva from the mouth, leading to bad breath. A dry mouth is the breeding ground for the bacteria. Dry mouth is also caused due to the decomposition of dead cells in the mouth and tongue. This causes stinky odor. Saliva is required to moisten and cleanse the mouth by neutralizing the acids produced by plaque. It helps to flush the bacteria or keeps them moving them so that they don’t settle and multiply. If not removed, the cells can decompose causing bad breath. Bacteria are one of the most common causes of bad breath. The bacteria releases out gases as we munch on food particles and substances broken down from the saliva. These bacteria multiply manifolds at night, when the salivary glands slow down. Tooth and gum infection are the main causes of bad breath. Yeast infection of the mouth and dental caries can also cause bad breath. These infections break down tissue, encouraging the flow of mucus that creates foul odors. Bronchitis, respiratory tract infection and cold can also cause bad breath. Breathing from the mouth dries its tissues, preventing the passing away of the bacteria that cause foul breath. This, in turn, encourages bad breath. Chronic diseases like kidney problems and diabetes can cause foul breath. Diabetes causes ketosis that often results in bad breath. In kidney diseases, the toxins from the organs are excreted through the lungs, causing bad breath. A polyp in the nose, tumor of the lung, throat, mouth and mouth can also cause bad breath. Smoking is another common cause of bad breath. It irritates the gums and nullifies the tasting ability. Smoking can also increase the possibility of gum diseases. Excessive alcohol consumption can dry out the mouth, leading to bad breath. Unhealthy dental habits like not cleaning and flossing the mouth properly can cause the food particles to remain in the mouth, promoting bacterial growth between the teeth and gums. The bacteria in the mouth interact with the food particles and tissues to create volatile sulfur compounds. Not cleaning the mouth can lead to bacteria build up, causing bad breath. Antibacterial mouth rinse can help reduce bacteria. Mouth diseases like bloody gums and dry mouth can exacerbate the bacterial growth, creating elements for the bacteria to putrefy. Keep an account of the foods you eat. Eating foods with strong odor can cause bad breath. Onion, garlic, protein, dairy foods, alcohol and tobacco are the main offenders in the food category. Chewing tobacco can stain the teeth and cause bad breath. It also reduces the ability to taste foods. Sugary foods are the main foods that cause mouth bacteria. Dairy and protein rich foods contain large amounts of amino acids, which encourages the growth of bad breath bacteria. Low carb diet causes the body to burn fat, creating toxic-smelling ketones. Flossing and mouthwash will cover the odor temporarily. The odor will not cease until the foods have passed through the body. This type of bad breath is temporary and can cure by avoiding that food. The most important remedy for bad breath is practicing a good oral hygiene. Brush, floss and clean the tongue twice a day. This will help to remove the food trapped between the teeth and gum line. The head of the brush should be small enough to reach all the areas of the mouth. Spend at least two minutes to brush your teeth. Ideally, brush your teeth an hour after eating your dinner. Do not brush your teeth immediately after eating, as the enamel is soft during the time. Clean the back of the tongue each day with a soft toothbrush or a tongue cleaner. Replace your toothbrush every 2 or 3 months and use fluoride toothpaste for brushing the teeth. Use good quality floss once a day to remove the food particles from the mouth. Dentures should be cleaned thoroughly before placing in the mouth. You can buy a number of effective mouthwashes to eliminate bad breath. Antiseptic mouthwash works best to treat the mouth odor. Unlike over the counter mouthwashes, antiseptic mouth rinse kills the germs and neutralizes the chemical causing bad breath. Avoid using alcohol-based mouthwashes as it can dry the mouth, causing bad breath. Dehydration is one of the most common causes of bad breath. Drink at least 2 liters of water daily to ward off the bad breath causing bacteria from the mouth. This will act as a humidifier, preventing dry mouth. Water will temporarily dislodge the bacteria, making the mouth fresh. In order to produce saliva, you must drink high amounts of water. Bad breath is often caused due to a build-up of heavy metals and other toxins. Hence, it is very important to flush the system through dietary intervention. Avoid the foods related to bad breath. Two cups of green tea a day can help you ward off the bad smell. Green tea contains polyphenol, a chemical that prevents the buildup and growth of bad breath causing bacteria. Add a small cinnamon stick to the tea. Cinnamon contains essential oils that fight stinky breath. Chew parsley and mint to combat the offensive smell. The herbs release scented essential oils when chewed, offering a quick solution to rancid smell. It contains high levels of chlorophyll that provide long-term benefits. A deficiency in zinc can cause halitosis. Thus, eat high amounts of zinc rich foods like pumpkin, cocoa, organ meats to address the problem of halitosis. Eating high amounts of cranberries prevents the formation of plaque and makes the bacteria less sticky, eliminating bad breath. Chew some sugarless gums to kill bacteria and reduce plaque. Eat some carbohydrate rich foods like fruits, vegetable and whole grains to prevent the flow of ketosis. Fruits rich in vitamin C like oranges, melons and berries kill the bacteria in the mouth, combatting bad breath. The citric acids stimulate the salivary glands, encouraging the flow of saliva. Other foods that combat stinky breath include crunchy and raw vegetables. They remove the food stuck in your teeth and stimulate saliva, preventing bad breath. Consuming acidic drinks like soda, alcohol and coffee lowers the pH value of the mouth, allowing the bacteria to flourish and release volatile sulfur compounds. Rinse your mouth after eating and drinking with plain water. This will help to balance the mouth’s pH levels. It also helps to remove the food particles left in the mouth. Have regular dental checkup. Visit your dentist at least twice a year for a thorough oral exam. The dentist will perform a professional teeth cleaning to detect any periodontal diseases and other causes of bad breath. The teeth cleaning process will remove tartar from the teeth, which, if left untreated can cause severe dental diseases. 1. A salt-water gargle is very useful for eliminating the bacteria of the throat and tonsils. 2. Chew on aromatic spices like clove, cardamom and fennel seeds after your meals. The seeds contain antimicrobial properties. Cloves are rich in euganol, a potent antibacterial that help to cure bad breath. Pop one clove in the mouth and keep it between the teeth. Continue chewing it until the aromatic oil permeates the mouth, then spit it out. 3. Use toothpaste that contains tea tree oil. Tea tree oil is a natural disinfectant, which kills the bacteria found in the mouth. You can also add a drop of tea tree oil to your toothpaste before brushing. 4. Mix one teaspoon of baking soda to your toothpaste to keep the foul breath at bay. Baking soda changes the pH level of the mouth, preventing the buildup of bacteria. You can also use toothpaste that already contains baking soda. 5. Massage your gums with a mixture of salt and mustard oil. This will tighten the gums preventing gum bleeding that cause bad breath. 6. Dilute 1 teaspoon of apple cider vinegar in a glass of water. Use this rinse as a mouthwash to get rid of bad breath. Hope you liked the article. Do leave us your comments below.